BC Studies is proud to award an annual prize to the author of the best paper published in the journal each calendar year. The prize, funded by donations, is intended to encourage and celebrate high-quality work on British Columbia, regardless of topic or discipline. In recognition of the generous lead donation of the UBC Museum of Anthropology, 2015-2030 recipients of the BC Studies Prize will receive a specially-commissioned piece of art work by Musqueam artist Susan Point. The prize-winning paper is announced in the spring issue of the journal, on the BC Studies website, and in other outlets, and will immediately be placed on Open Access. The prize operates on a calendar year basis. All papers published in the journal between 1 January and 31 December each year will be eligible for consideration. 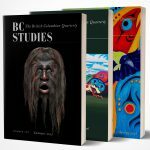 The BC Studies Prize is awarded to the paper judged by the editors and members of the BC Studies Editorial Board to have made the greatest contribution to understanding British Columbia in the previous year, primarily on the basis of the significance and originality of the research but also taking into account the career stage of the author. Authors of co- and multi-authored articles will need to nominate one of their number as recipient of the prize artwork. All papers published in the journal will automatically be eligible for the award of the prize. There is no additional application procedure. Nicolas Graham, “State-Capital Nexus and the Making of BC Shale and Liquefied Natural Gas,”published in BC Studies no. 194, Summer 2017. Runner up: George Abbott, “Persistence of Colonial Prejudice and Policy in British Columbia’s Indigenous Relations: Did the Spirit of Joseph Trutch Haunt Twentieth-Century Resource Development?” published in BC Studies no. 194, Summer 2017. Sabina Trimble, “Storying Swílcha: Place-making and Power at a Stó:lõ Landmark,” published in BC Studies 190, Histories of Settler Colonialism in the Summer of 2016. Runner up: Thomas McIlwraith and Raymond Corimer, “Making Place for Space: Site-specific Land Use and Occupancy Studies in the Context of the Supreme Court of Canada’s Tsilhqot’in Decision,” published in BC Studies 188 in the Winter of 2015/16. Caroline Grego, “Maybe National Park: Consultation, Conservation, and Conflict in the Okanagan-Similkameen,” published in BC Studies 186 in the Summer of 2015. Runner up: Mica Jorgenson, “‘Into That Country to Work’: Aboriginal Economic Activities during Barkerville’s Gold Rush,” published in BC Studies 185 in the Spring of 2015.